Social media is an important consideration for small businesses. Facebook has become a way of directly communicating with your customers and is often used to launch new products, promote events, even advise on late bookings and special offers. Blogging is also becoming an increasingly important way to connect with customers, or for some businesses and organisations, a way to consult with their public. 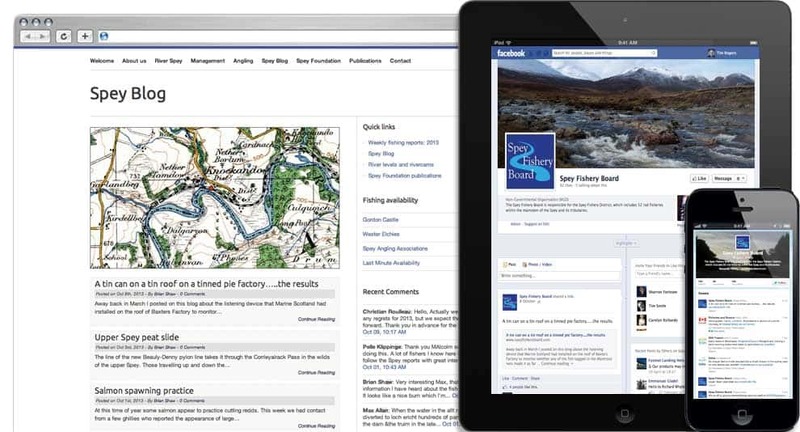 The Spey Fishery Board is responsible for the Spey Fishery District, one of the world’s greatest salmon rivers. The board manage one hundred and seven miles of main stream river: that’s approximately five hundred and sixty miles of tributaries and twenty miles of coastline in the Moray Firth, stretching from Lossiemouth in Moray to Cowhythe Head in Aberdeenshire and three nautical miles out to sea. Given the range and importance of its work, disseminating information on its activities are essential, as is the need for public dialogue. Project 404 set up a blog on the organisation’s main website to allow the Chief Biologist and Head Ghillie to regularly report on the organisation’s work in a way that facilitates public feedback. We also included a Facebook and Twitter feed to allow fishers, farmers and those needing access to the river to stay up to date with events. © 2019 Project 404 All Rights Reserved.